Take a look as where Sharon Eisenshtadt is shopping. As the owner of the fashionable SHE, a boutique in Bloomfield Hills, Sharon Eisenshtadt's calling card is her personalized service and impeccable appearance, which she owes to her "village" of knowledgeable beauty pros, a select group of proven beauty products, and to practicing Vinyasa yoga with her husband about five times per week. 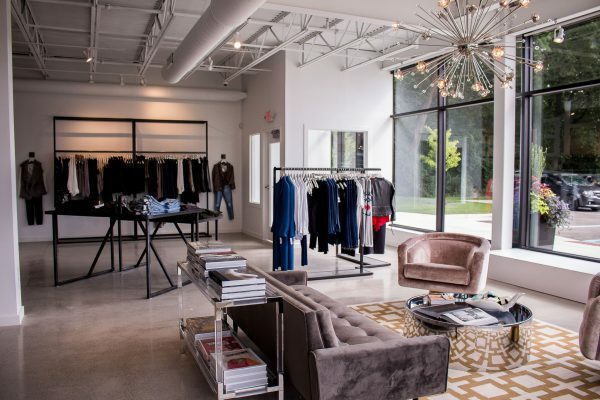 For over six years, savvy Bloomfield Hills shoppers have come to rely on the luxury clothing store SHE to deliver a shopping experience usually only found in cities like New York or Los Angeles. As the daughter of a former longtime Chrysler executive, Eisenshtadt’s personal taste in automobiles has grown out of a deep connection to the American car industry. Her first vehicle was a white 1990 Dodge Daytona with a sunroof, given to her by her parents for graduation. “I remember driving around the block with friends for hours at a time, listening and singing along to a cassette mix of B-52s, Madonna, Elvis Costello, and Elton John,”Eisenshtadt recalls. In recent years, Eisenshtadt’s passion for American cars has grown even more with the challenges the auto industry has faced in Detroit. “Glamour, menswear with a feminine twist and bling all the way down to your shoes,” is how Sharon Eisenshtadt, retail fashion expert and owner of SHE in Bloomfield Hills, sums up the overall feeling of the fall 2012 styles. The metro Detroit native got started in the retail industry almost 25 years ago, when she worked at Bivouac in Ann Arbor. From there, Eisenshtadt’s career took her to managerial positions at department stores, most significantly as director of personal shopping at Marshall Field’s, where she helped dress hundreds of customers. The owner of SHE, a hip designer clothing and accessories boutique, which opened in August in Bloomfield Township, Sharon Eisenshtadt is a busy mom of two kids, ages 9 and 11, and is married to Howard, also known as the “H” in SHE’s acronym. Talk about your outfit and why it showcases your sense of style.